Whether you prefer the simple luxury of a soaking tub, the invigorating deep-tissue massage of a whirlpool, the light full-body thermo-air massage, or a combination of the two, MTI offers multiple configurations to meet your specific needs. In MTI's production facilities, you will find no robots; only real people. 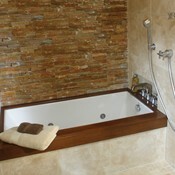 MTI allows you to customize your bath. They enable you to have maximum control in creating your personalized bathing experience for your bathroom. 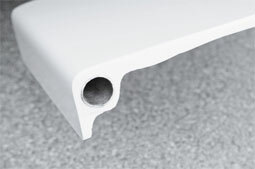 Tubz.com is here to help you create the perfect MTI bath for your bathroom. MTI Whirlpools is an American-owned company. Their Hydrotherapy Systems, including whirlpool systems, air baths and all combination systems are manufactured in the USA. 70% of the cost of these products is USA labor and USA-made materials. MTI is also employee-owned. This creates a culture of creativity and discipline resulting in innovations, solutions to customer needs and a steady stream of great new products. Real entrepreneurial spirit. Premium style and quality tubs, highly customizable with many options and handmade in cast acrylic. Value-priced selection of tubs in popular sizes and shapes, easy to install and manufactured with handmade quality in cast acrylic. 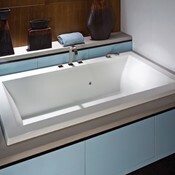 ImportantMTI bathtubs offer proven advanced therapies to help you achieve a healthier lifestyle. All MTI soaking bathtubs are ergonomically designed for maximum comfort with a thick cast acrylic shell that keeps bath water warm longer. 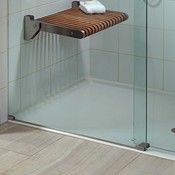 Add a re-circulating pump/heater to create a heated soaking tub. Benefit from the power of a MTI whirlpool - deep, penetrating massage. This type of hydrotherapy comes from strategically placed jets that may be targeted to specific areas of the body. 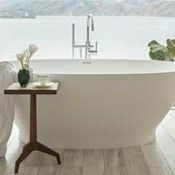 Operated by a whisper-quiet pump, MTI whirlpool baths use a mixture of air and water that adjusts from a gentle swirl to a more vigorous pulse. The blissful combination of water, heat and air movement creates an incomparable effect that is as therapeutic as it is relaxing. The movement of millions of tiny air bubbles activates the lymphatic systems, increases blood flow, stimulates endorphins and relieves sore muscles and other painful ailments. MTI air systems provide a full-body massage experience via air jets located in the bottom of the bathing well. Microbubbles innovative technology super-saturates the water with up to 50% more dissolved oxygen than regular water alone. Billions of tiny oxygen-rich microbubbles gently remove impurities from skin and pores, leaving the body cleansed and gently exfoliated. The result is skin that is hydrated, moisturized and restored, feeling soft, smooth and supple. Affordable quality. Fast delivery. Made in the USA.